The screen shot above depicts a service record example for DNSMadeEasy. Most of the fields in this dialog are self explanatory, but some fields require brief explanations. DDNS Password and DDNS ID: The dynamic DNS password is the password you defined when you configured the A record for your domain. If you do not remember it, follow these steps to locate it. Login at DNSMadeEasy.com using your credentials. At the top menu bar, select "DNS", and then "Managed DNS". At the left side bar, under the "Purchased services and usage" heading, select "Domains". In the "Managed Domains" table, select the domain of interest. In the "Records" tab, select the A record of interest, and then select the "Edit Record" icon (pencil). The Dynamic DNS Password and Dynamic DNS ID fields are displayed in the pop-up window. 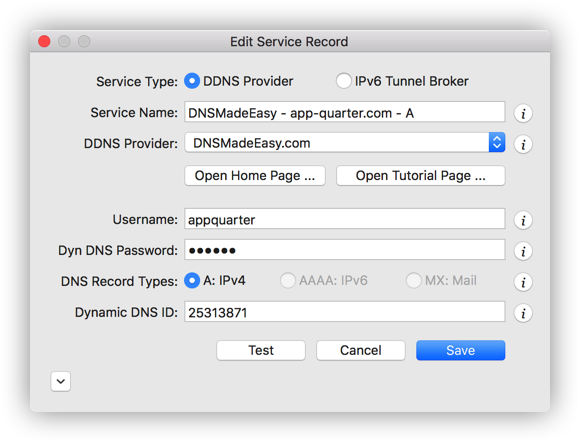 DNS Record Types: DNSMadeEasy supports dynamic DNS records of type A.